There is a comfortable 8 feet between the two fences to accommodate even the largest horses. 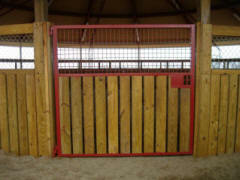 The moving gates are double hinged at the top and have a livestock electric fence system installed on each. The electric fence system is controlled at the main control box with an illuminated switch. The main control box and the disconnect located on the outside of the outside fence. The keypad will read the speed of the machine in miles per hour. 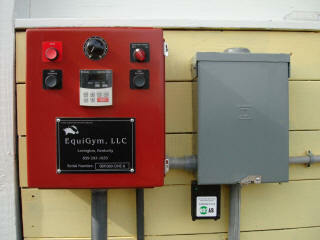 This is EquiGym’s newest design in horse exercising equipment. 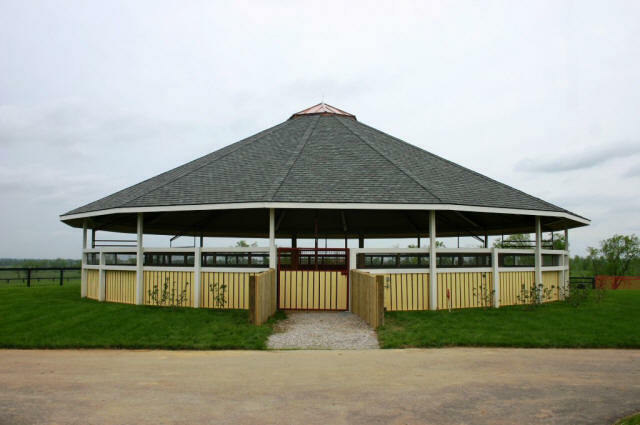 This quiet exerciser is made from structural steel and is tightly tucked under an elegant roof structure, giving clean lines and a lot of open space underneath when working horses in the round corral. There is 20 feet of clearance from the bottom center of the machine to the working surface of the round corral. 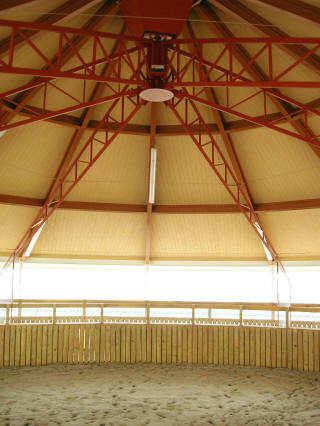 The round corral diameter for this 6 horse Overhead Horse Exerciser is 54 feet. 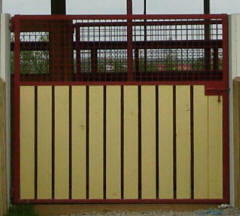 The fences can be custom designed per application. 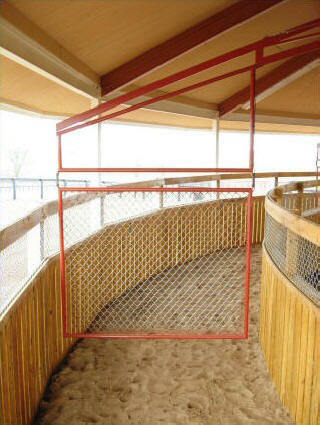 We recommend that good airflow and visibility for your horses be created in the fence the designs. This fencing is 2” x 6” treated boards placed vertically with 9 gauge chain link for the top 2 feet. There are strong boards on the bottom of the outside fence to hold the surface banking so the horses joints will land level while they are exercising in a circle at higher speeds. The inside of the round corral has a recessed push button control box that will override the exterior control box to run the machine. 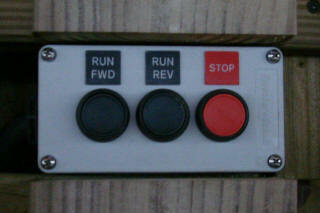 The remote push buttons will stop the machine or run the machine in forward or reverse. 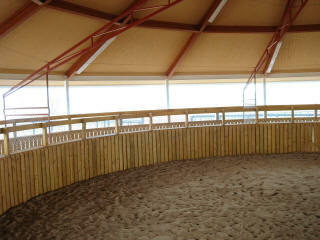 The box is recessed into the wall of the round corral so that a loose horse cannot get to it. 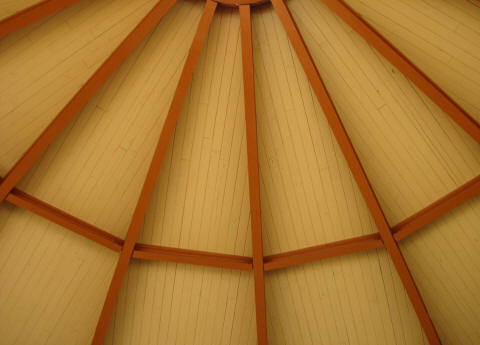 The machine has been designed to be attractive, durable and solidly attached to the center of the roof structure. There is a water line brought up to the center of the roof to a swivel, then the line runs down one arm to the bottom of a moving gate to water the exercising surface of the horse exerciser part of this building. There is a cupola above the machine to ventilate the air through the center top. The machine is painted in a Sherwin Williams KEM 400 primer and paint and EquiGym can match any farm color. The Underside of the Tongue and Groove structural wood and the steel members are also primed and painted in the farms color scheme. 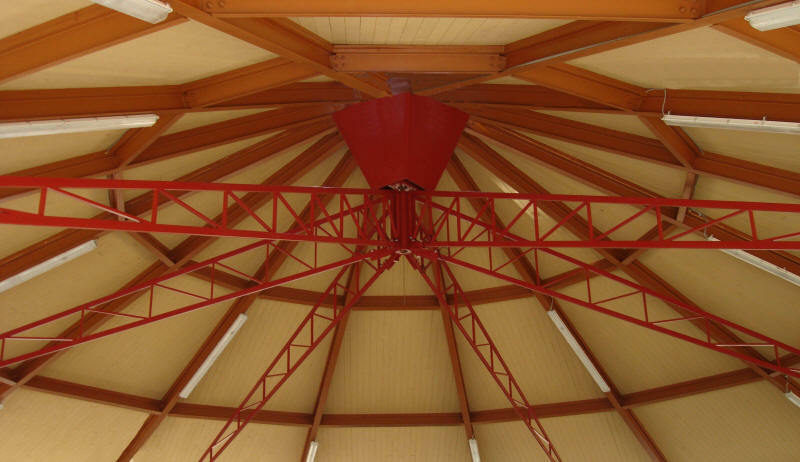 This engineered roof structure is made from steel I-beams with box beam posts. This roof has steel compression rings with beautiful structural tongue and groove deck boards on top and composition shingles on the outside. This Overhead Horse Exerciser is also a Billy Estes Construction quality installation.